Very difficult to find large track of land in the Driftless region of Sauk County WI. 466 acres offering a mix of tillable, woods, wetlands, & river frontage. This is an outstanding hunting or recreation farm. 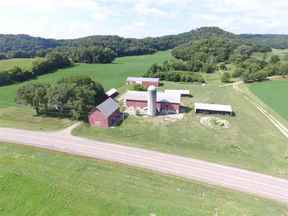 112 acres of quality tillable land runs up a secluded valley with large stands of timber guarding each side. There are trails throughout the property allowing easy access and numerous options for hanging stands. 135 acres South of Hwy 60 are primarily low marsh lands for waterfowl hunting leading to the Wisconsin River with over 1/2 mile of frontage. Owner would sell 331 acres north of Hwy 60.